Twilight In Central Park is a piece of digital artwork by Rod Chase which was uploaded on January 13th, 2010. 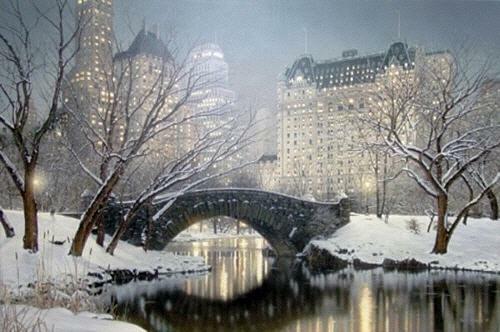 A snowy mist is rising over the Gap Stow Bridge in Central Park with the glowing lights of the New York City skyscrapers and Plaza Hotel in the background and reflected in the water. Rod Chase has captured the beauty of a winter evening with his photo realistic style. This sold out giclee canvas image is limited to 150 s/n. See this and more of his work on the web site and at Art Gallery of the Rockies.